I’ve been thinking a lot about spiritual warfare. 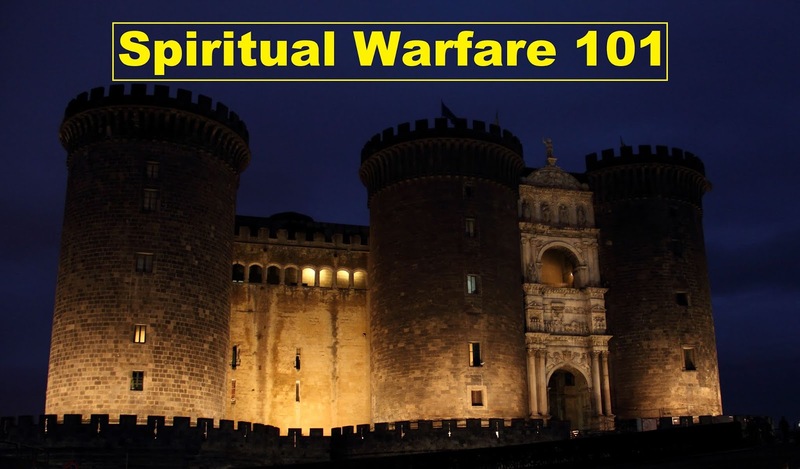 Five minutes on the internet will reveal so many possible opinions on what spiritual warfare actually is, from prayer to God to fighting off demons. You’ll find people who are adamant demons can’t touch followers of Jesus, to Christians who blame demons for every little hardship, and even people who say demons aren’t real and never existed. Most of these opinions are based on speculation and personal experience, influenced by tradition, and sometimes have a bit of obscure scripture references mixed in. So that I’m not just adding my voice to the choir of disagreement, I'd like to share some thoughts on this by ignoring what we think we know and getting back to the basics of spiritual warfare 101, basing everything on scripture alone. "Be strong in the Lord and in the strength of His might. Put on the full armor of God, so that you will be able to stand firm against the schemes of the devil. For our struggle is not against flesh and blood, but against the rulers, against the powers, against the world forces of this darkness, against the spiritual forces of wickedness in the heavenly places." The last time I read Ephesians, I was struck by Paul’s words. I have a lot of struggles in my life right now. I’m changing careers, moving to a new country, dealing with legal hurdles, planning a wedding, practically living in airports, and dealing with a major injury. All of these struggles are flesh and blood -- my health, dealing with people in the government, finding a place to live and a way to support myself and my future wife. But Paul is saying that all of my struggles are misplaced. My struggle is not against flesh and blood. What about you? What are you struggling with right now? Your physical health? Mental illness? Finances? Your boss or coworkers? Your family? A relationship? Addiction? Sin? Guess what. That struggle is just flesh and blood. As important as whatever that thing is, there is something far more important and far more powerful affecting your well-being. Your worry and effort is misplaced. Your struggle is actually against rulers, powers, dark world forces, and wicked spiritual forces. Those are demons. Whatever effort we are investing in our struggles against flesh and blood, we need to start investing even more effort in spiritual battles. So it’s important for us to understand how to battle. And in order to battle, we need to understand how our enemy operates. So how do demons work against us? In the gospels, we read that Jesus demonstrated his power over demons by commanding them to come out of people. He then gave his disciples the same power to cast out demons, and they did. This is interesting to me because I’ve always thought of spiritual warfare as something that happens outside of believers -- maybe temptations, or frustrations of life circumstances working against us. But if demons come out of people, they must first be inside of them. Maybe in horror films, evil spirits can influence the world around someone. But that is the natural works, not the spiritual. Evil spirits aren’t physical, they are spiritual. Where in the Bible do we read about an evil spirit influencing someone from outside of them or affecting the world around someone? The Holy Spirit works inside of us (Romans 8:9) and evil spirits work the same way. Spiritual warfare is something that happens inside of us, deep in our spirits. It’s easy to blame sin or challenging circumstances on spiritual warfare, but that’s not a full understanding of spiritual warfare. Demons don’t affect our circumstances. They work in our spirits. They affect our minds, hearts, and bodies. They influence our thoughts, emotions, and physical health. For some, this takes the form of voices and visions. But for most, myself included, spiritual warfare can be as innocuous as thoughts and ideas. These are things like anxiety, doubt, discouragement, depression, temptation, and negative ways of thinking. I believe one of the secrets to spiritual warfare is the discovery that the voice of a demon sounds just like your own voice. The thoughts of a demon feel just like your own thoughts. If you’ve ever wondered why demons seemed so common while Jesus was on earth, but are so rare today, here is your answer. Demons aren’t actually rare at all, in fact they are incredibly common. They’re just very good at hiding. As the famous line goes, “The greatest trick the devil ever pulled was convincing the world he didn’t exist.” Being able to tell the difference between your thoughts and the voice of a demon is called discernment, and it’s something that takes awareness and practice. You have to be aware of your thoughts to know which ones aren’t from you. This is why mindfulness, which is simply being aware of your thoughts, has exploded in recent years and brought relief for many ailments. People using eastern practices to analyze their thoughts and get control of their minds. But if they do it without the power of Jesus, they may end up in a place worse than when they started. The problem is, it’s possible to be a believer in Jesus but not have the Holy Spirit (Acts 19:1-7). It’s even possible for someone who has the Holy Spirit to not be filled with the Spirit (Acts 4:31, Ephesians 5:18). Jesus made it clear that multiple spirits can occupy a person. If someone has the Spirit of God but isn’t filled, demons are happy to occupy the leftover space. Some would say that the Holy Spirit would never dwell in an unholy place with a demon -- but you had better hope he does! Otherwise, what hope do we have as unholy people? Thank God that he is patient and loving toward sinners! The Holy Spirit convicts us of sin (John 16:7-8) so so must tolerate sin at least long enough to free us from it. So then, believers in Jesus shouldn’t have demons, but unfortunately, many do. That’s because even though they claim to follow Jesus, they allow demons into their lives without even knowing it. So then how do we get rid of them? This is just a 101 introduction to spiritual warfare. If a believer is so vulnerable to attack, than a believer must know how to fight off an attack. We will look at how to do this in the next post.